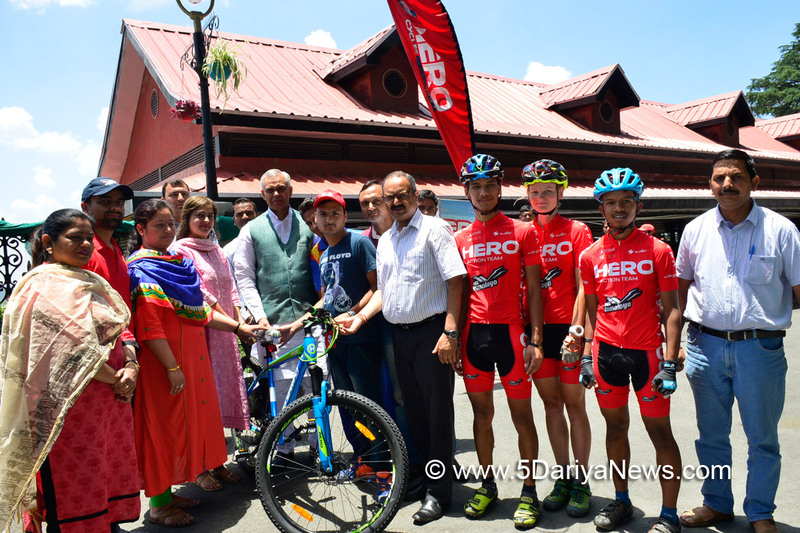 Governor Acharya Devvrat distributed cycles to the players of Special Olympic Himachal Pradesh selected for International Level winter sports events of Special Olympic to be held in Abu Dhabi at Raj Bhawan, Shimla today.Nine special players and three coaches have been selected from Himachal Pradesh for these events and Himachal Adventure Sports and Tourism Promotion Association (HASTPA) would prepare and help them for International Level winter sports events.The Governor congratulated the players and greeted them for their success. He said physical disability was not a weakness and with courage and utter determination any person can achieve his goals in the life. He said any sort of deformity could not be considered as disability and in real sense such persons are disabled who lack will and commitment for work. He said that better facilities and more opportunities should be given to them so that they could do their best.Smt. Payal Behl Vaidya, General Secretary, Himachal Pradesh Council for Child Welfare, Smt. Kimmi Sood, Member of the Council, Shri Prikshit Mehdudiya, Area Director, Special Olympic Himachal Pradesh were also present among others.